Fargo was started by Walter Chrysler in 1928, the same year he formed the Chrysler Corp and bought the Dodge Brothers company. The brand was used to sell commercial trucks but eventually it was eclipsed by Dodge’s line of trucks, later to be revived as a Canada only brand. In 1958, the Fargo pickup, identical to the Dodge D100, received the “Sweptside” styling that its sibling received a year earlier to match the “Forward Look” cars that Virgil Exner had styled. This is a very rare vehicle, as only 11 were produced. 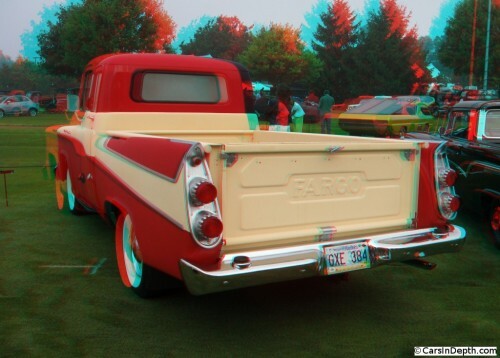 This entry was posted in 3D Imagery, 3D Photos and tagged 1958 fargo pickup, 1958 fargo sweptside, fargo. Bookmark the permalink.